For the past week I have been on a trip through New Brunswick and P.E.I. checking out the beautiful scenery, delicious seafood and various neighbourhood libraries. 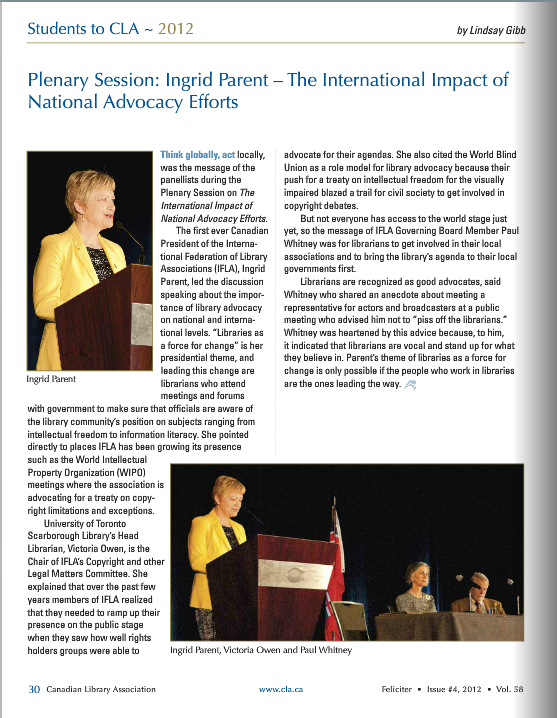 Upon my return to Toronto I noticed that a digital version of the Canadian Library Association’s Feliciter was released featuring a few articles I wrote during my time as a Student to CLA for the CLA conference in Ottawa this June. This is the first electronic-only edition of the magazine. A double page spread of conference attendees in this issue includes a photo of me and two of my fellow Students to CLA (Jessica Thorlakson from the University of Alberta and Kathryn Alexander from Université de Montréal) as well as a great photo of Andrea Siemens (children’s librarian for Cambridge Libraries and Galleries) using puppets to explain why librarian’s values are not outdated. Click here to view the digital edition. Stay tuned for a report on my experience as a library tourist in New Brunswick.